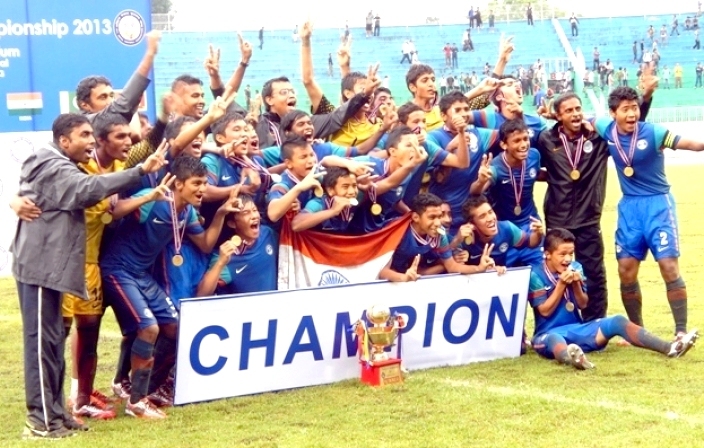 India are U-16 SAFF Champions! India represented by All India Football Federation’s Regional Academy blanked hosts Nepal 1-0 in the final played at the Dasharath Stadium in Kathmandu on Wednesday (July 30, 2013). Left back Jerry Lalrinzuala scored the only goal of the match – a World Class left-footed long ranger in the 18th minute – to script a well-deserved win for a side that has won every game in the biennial tournament. On a rain-soaked afternoon in Kathmandu, India dominated proceedings from the kick-off, with the boys showing exemplary maturity to adjust to the slushy underfoot conditions. Despite being backed by a partisan crowd, Nepal were pushed on the backfoot. Birthday boy Jerry could not have asked for a better gift. The 14-year old Mizoram lad impressed one and all with his darting overlaps down the left flank and was rewarded for his performance in the 18th minute. Latching on to a loose ball just outside the 18-yard box, Jerry unleashed a venomous 30-yarder out which crashed into the top corner of the net. India led 1-0 at halftime. The colts in Blue continued to impress post the breather as the rain kept pouring down. Jerry almost doubled his tally ten minutes into the second half when his free-kick from just outside the box went inches wide and then in the 66th minute, midfielder Deependra Singh Negi’s attempt from close was fisted away by the Nepal custodian. If the first essay was about India’s raids, the second period brought to the fore their rock-solid rearguard. If skipper Jayananda Singh’s last-ditch tackle in the 84th minute saved a sure shot goal, goalkeeper Dheeraj Singh had a match to remember making some crucial saves to keep the hosts at bay, especially in the last quarter of the match. Head Coach Gautam Ghosh lauded his boys after the victory. “The triumph shows that we are on the tight track. It all began from scratch when we roped in talented boys from all parts of the Country,” an elated Ghosh told www.the-aiff.com. “Right from day one Robert Baan and Scott O’Donell showed us the path to tread on and they have continuously monitored our progress. I reiterate that ours is a Developmental Process and results don’t matter,” he added. “But having said that, this was a Final and a positive result would always have an inspirational effect on the boys. I’m proud of them the manner they held on in front of a 20000 plus partisan crowd,” he pronounced. “The message from National Coach Wim Koevermans and National Team Captain Sunil Chhetri had a huge influence on the boys. We all look up to them and a message from them to the U-15 kids meant a lot. We are happy that we have been to keep everyone smiling,” he maintained. Kick out the politicians & businessmen from all sports federations.